C# is used for server side execution for different kind of application like web, window forms or console etc. In order to use C# with your .Net application, you need two things, the .NET Framework and an IDE (Integrated Development Environment). The .NET Framework is a platform where you can write different types of web and desktop based applications. You can use C#, Visual Basic, F# and Jscript to write these applications. If you have the Windows operating system, the .NET framework might already be installed in your PC. Check MSDN to learn about .NET Framework dependencies. An IDE is a tool that helps you write your programs. Visual Studio is an IDE provided by Microsoft to write the code in languages such as C#, F#, VisualBasic, etc. Use latest version of Visual Studio (2017) to learn C#. You can write C# code with notepad also. Build your C# program using command line tool csc.exe. Visit MSDN for more information. Visual Studio Community edition is a free for individual developer for personal or commercial use. However, you can purchase a license for Visual Studio Professional or Enterprise edition. Download and install Visual Studio Community from visualstudio.com for free. C# can be used in a window-based, web-based, or console application. 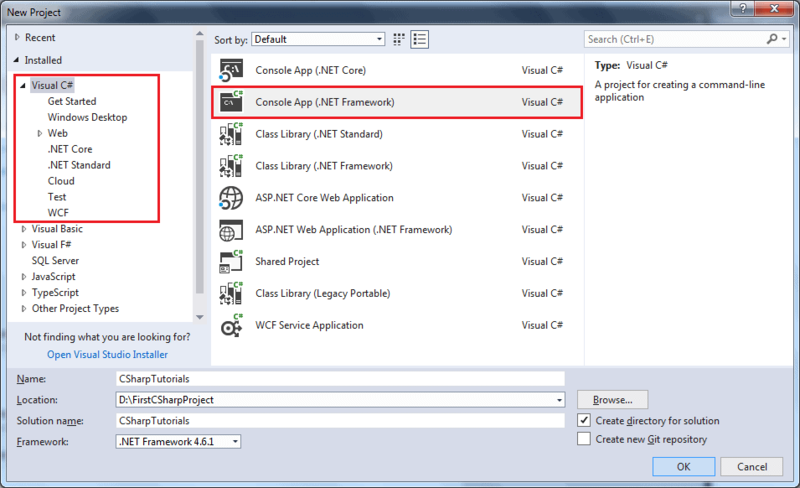 To start with, we will create a console application to work with C#. Open Visual Studio 2017 installed on your local machine. Click on File -> New Project... from the top menu as shown below. From the New Project popup as shown below, select Visual C# in the left side panel and select Console App in the right side panel. In the name section, give any appropriate project name, location where you want to create all the project files and solution name. 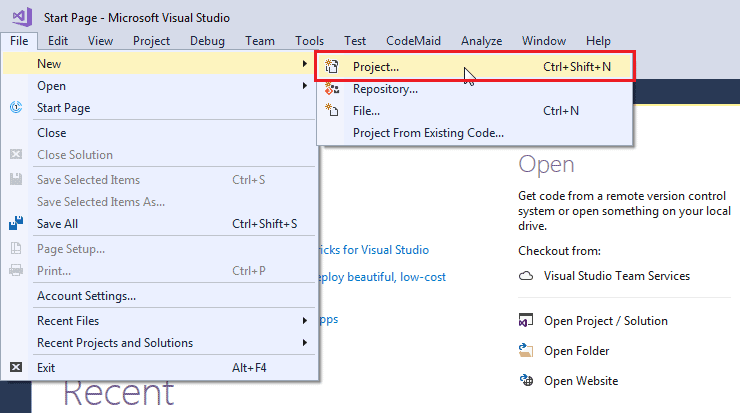 Thus, you can create a C# console application in Visual Studio. 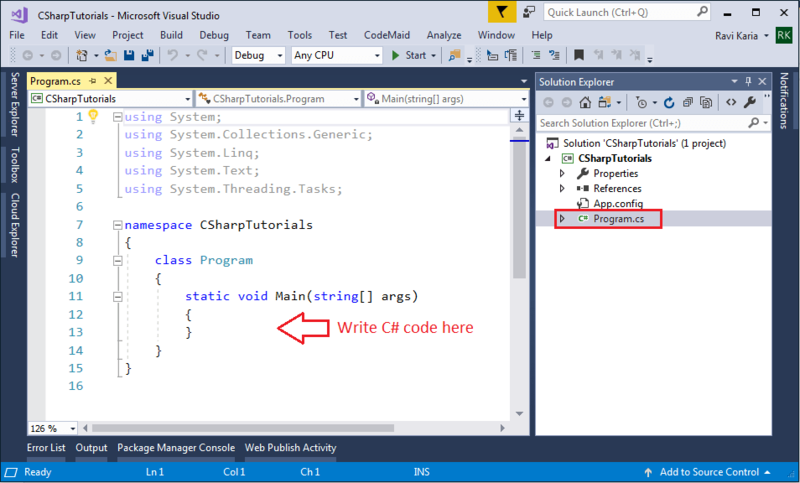 Now, you can write C# code in program.cs file to play with C#. Let's write first C# console program in the next section.